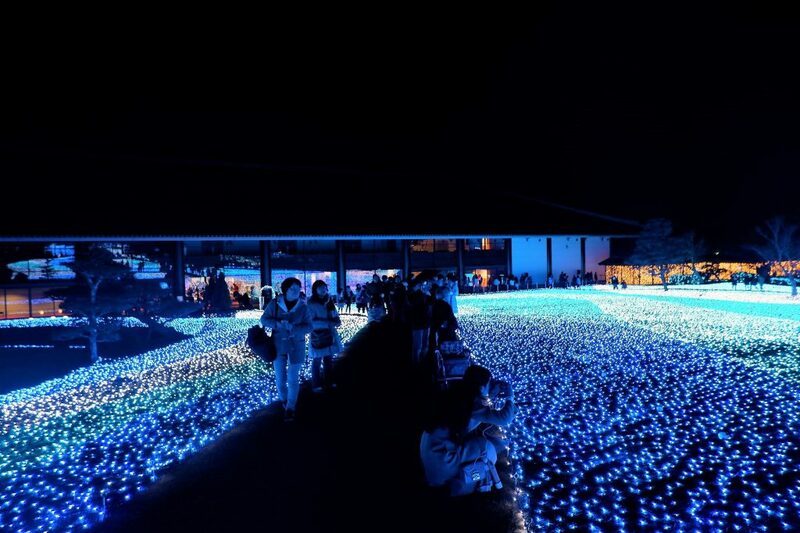 Nara Rurie Illumination’s main attraction, Winter Tanabata Road, at the Kasugano International Forum . 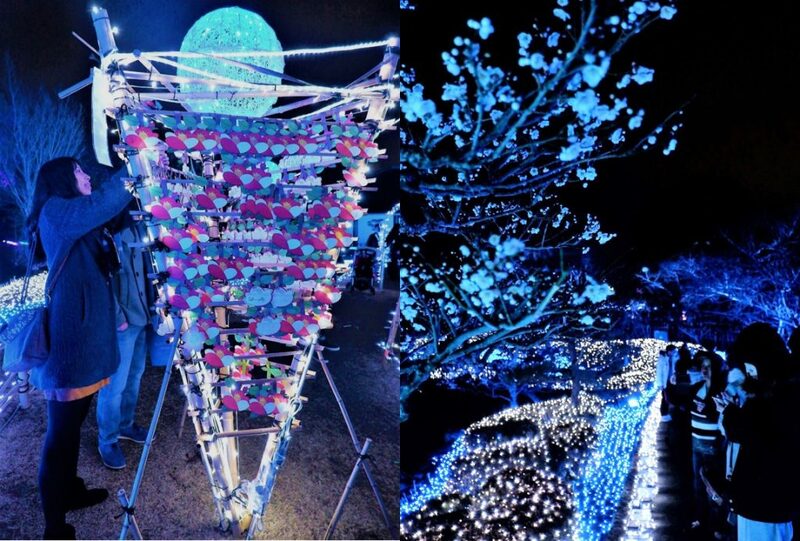 The week of Valentine’s Day glowed anew as the annual Nara Rurie illumination event was held nightly from February 8 to 14, 2019 in the surrounding areas of Nara Park (奈良公園), Todaiji Temple (東大寺), and Kasuga Taisha Shrine (春日大社). Although it offers a romantic scene and is popular among couples, this event is not dedicated for the celebration of Valentine’s Day. It is actually for honoring the “happiness corridors” (しあわせ回廊, shiawase kairō), which are the pathways connecting Todaiji temple, Kasuga Taisha Shrine, and Kofukuji Temple (興福寺): Nara’s three important sacred sites. “Rurie” (瑠璃絵) is a term meaning “azure corridor,” which alludes to the Silk Road trade where azure, a blue-colored mineral was introduced to Japan. It has ever since been regarded as a sacred color associated with happiness. Illuminating the “happiness corridors” with a sacred azure hue has then been a tradition to bring happiness and clarity of mind in prayer for its visitors. What a deer sight among blue lights. Visitors hanging tanzaku on the trees (left). Early bloom of pretty plum blossoms also get attention (right). 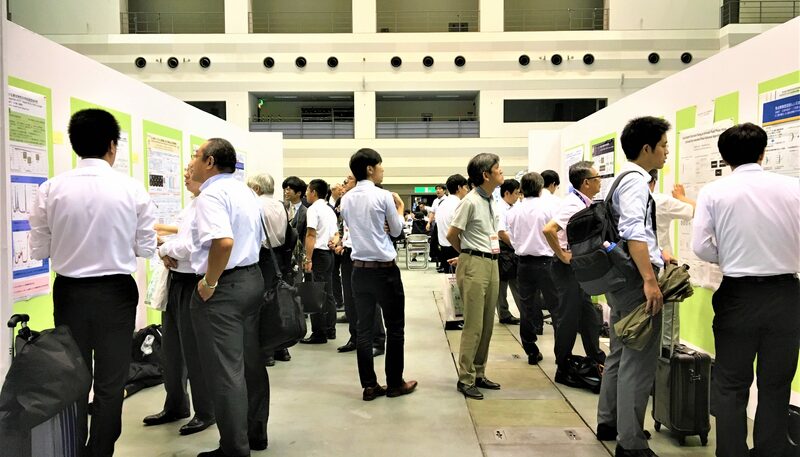 Located at the heart of the area is Kasugano International Forum, which houses the main event attraction. 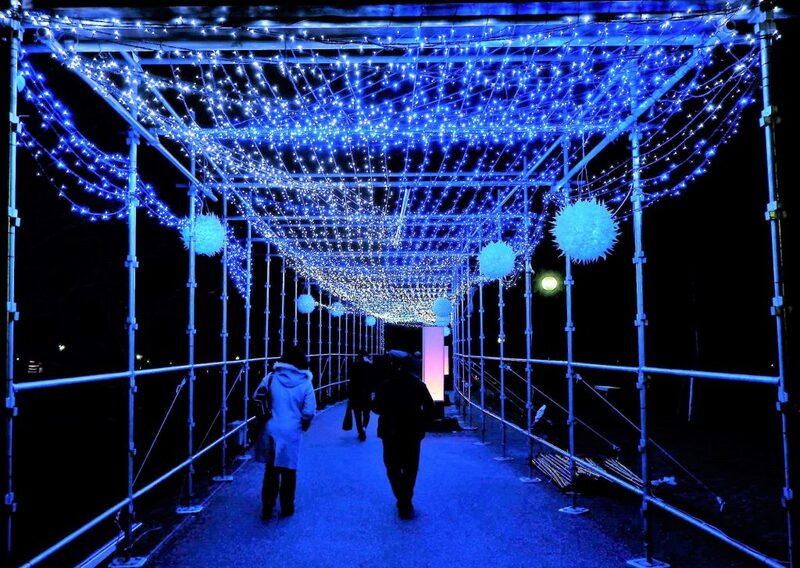 Named the Winter Tanabata Road, it is a garden covered with of blue and white LED lights. 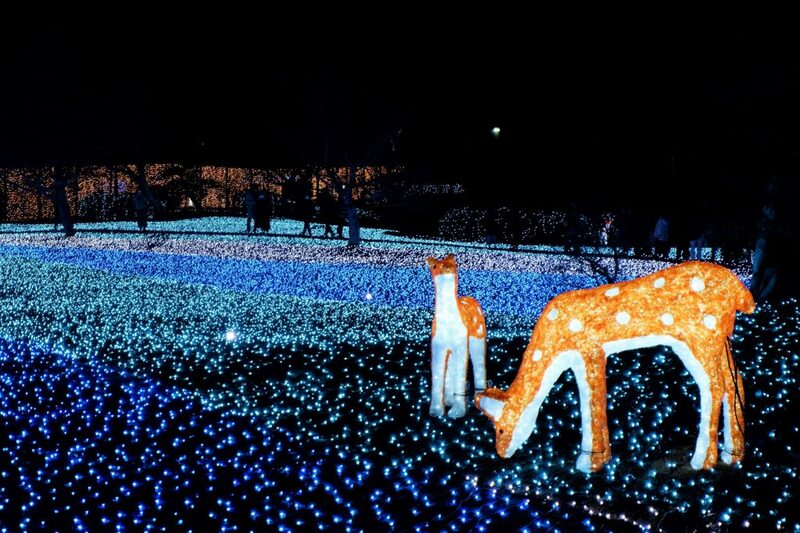 Not to be missed are some deer prancing amidst the lights, which in no better way represents Nara Park. Entrance to this main attraction can be either free or paid. The free-zone gives access to a remote viewing of the LED-clad gardens, while the paid area allows a close up experience for a minimal fee of ¥500. As a form of ticket, visitors are provided with a tanzaku (短尺), which is an apple-shaped paper where they can write wishes. The tanzaku can then be hung on trees situated at the end of the Winter Tanabata Road. 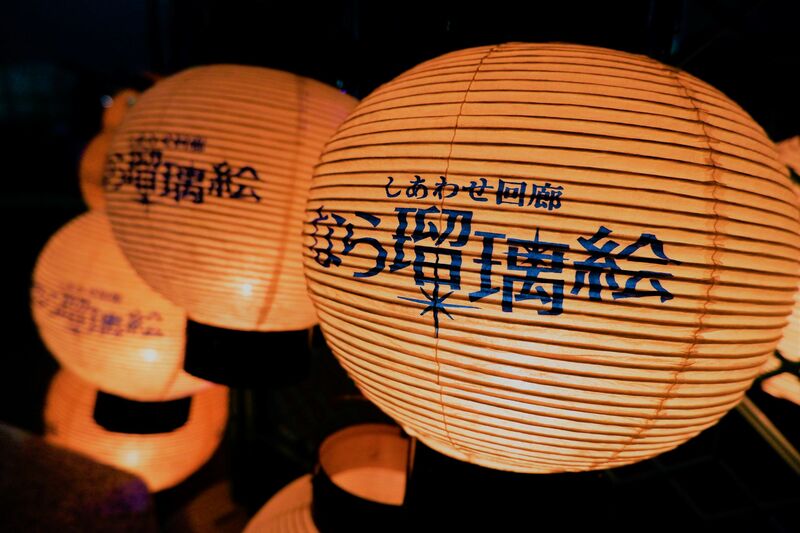 Other events outside of the Kasugano International Forum includes special night admissions to the surrounding museums, shrines and temples, Fortune Cocoa selling (or しあわせココア – shiawase cocoa) , Lighting Yorukagura (光の夜神楽, a sacred Shinto dance), and Sky Lantern Anniversary event. Capping off each year’s event on Feb 14th is a ten-minute fireworks display at the Kasugano Park to commemorate the Nara Park anniversary (turning 139 years this 2019). Visitors can’t get enough of the sea of blue lights. This annual tradition, now on its 10th year, is just one of the many events that are held within the vicinity of NAIST. Aside from visiting famous tourist attractions, students should not miss cultural events such as the Nara Rurie in order to absorb and appreciate Japanese culture.